Yep, there's a Steam sale too. 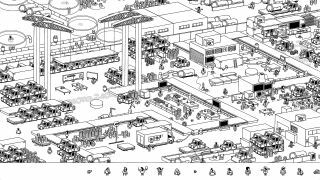 Fans of the vanishing, jet-setting scamps from the Where's Wally/Waldo series will want to check out Hidden Folks: a game of seeking out tiny, hard-to-find targets in giant, beautifully animated scenes. The game came out in February, and now it's just been embiggened with a free update that adds a new area chock-full of wee cartoon people. Oh, and there's a sale on to celebrate the occasion. The update adds eight new languages, more character animations, and other bits, but the main attraction is the new Factory environment, which consists of "19,475 sprites, 3400 interactive objects, 921 characters, 540 sounds, and 28 targets". Which sure sounds like a hell of a lot. It's "by far the most complicated area we've ever made," developer Adriaan de Jongh reveals. If you're wondering how the team put the Factory, not to mention the rest of the game, together, here are a series of recent blog posts that explain developers Adriaan de Jongh and Sylvain Tegroeg's process.